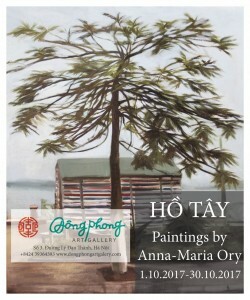 The exhibition "Hồ Tây" (West Lake) by Hungarian Artist Anna-maria Ory has been being displayed at Dong Phong Art Gallery, 3 Ly Dao Thanh street, from 1st October to 30 October, 2017. The title of the exhibition is “West Lake”, as several paintings were painted at the west coast of the lake. The subject and the technique of the pictures mix the elements of both Eastern and Western traditions, as an attempt to establish connections between two very different cultures which nevertheless have a lot in common. The painter’s relationship with Vietnamese culture dates back to her childhood, when her parents shared their love for Việt Nam with her. As a student at the Hungarian University of Fine Arts, she met several Vietnamese artists who furthered her interest in the country, its people and its art forms. I participated at the Vietnam–Hungary contemporary fine art exhibition in Hanoi and HCM city. Between 2016-17 I had the possibility to stay in Vietnam for a longer period and thus got familiar with the art and culture of Vietnam. The paintings exhibited at the Dong Phong Art Gallery were made in Hanoi in 2017.